This page develops resources and ideas for students of all ages to increase our understanding and awareness of important global issues. The urpose of the site is assist tutors in their pastoral roles. 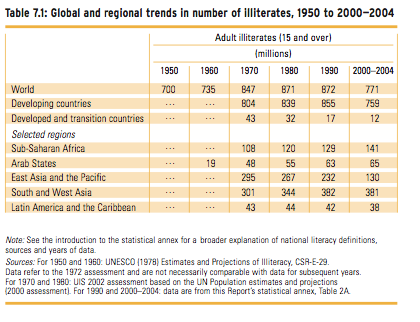 UNESCO state that about 774 million adults lack the minimum literacy skills. This amounts to one in five of every adult. 516 miilion are women and a further 75 million children are out-of-school and many more attend irregularly or drop out. However, literacy is also a cause for celebration because there are nearly four billion literate people in the world today. 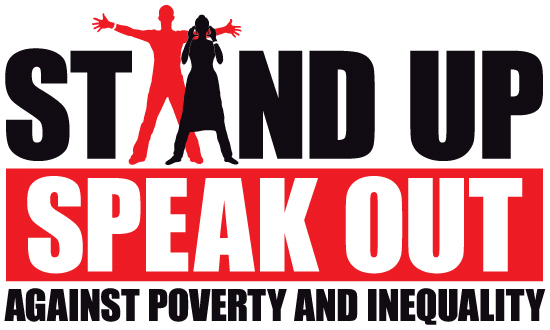 Use the resources below to raise awareness with your students on the problems of illiteracy and its link with poverty. Illiteracy is illustrated below in two forms; the inability to read and write and the inability to use a computer. The UN defines illiteracy as the inability to read and write a short sentence about their life. The aim is to produce school tile or collage wall of illiteracy. Provide your students with an A4 paper (a Tile) one sheet to a small group of three or more. Students should illustrate their tile in colour to show the connection between illiteracy and poverty. Students can draw an image, produce a political cartoon, or write a diary entry of an illiterate person to show the challenges that they face. Tutor can collect the tiles and pin them up in a communial public school area or in their tutor base. Thanks go to Yashika Mody and Chichi Lin from the American School of Singapore and Compassion International. 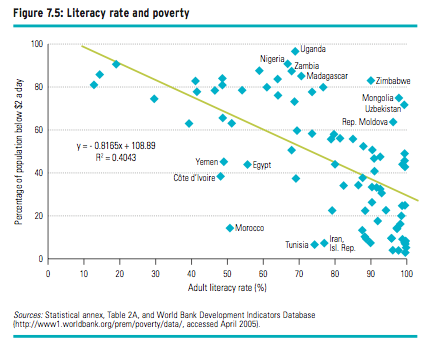 More senior students may wish to examine the data contained in the following graphs and focus on the geographical distribution of illiteracy as well as the change over time. What factors explain Asian illiteracy? 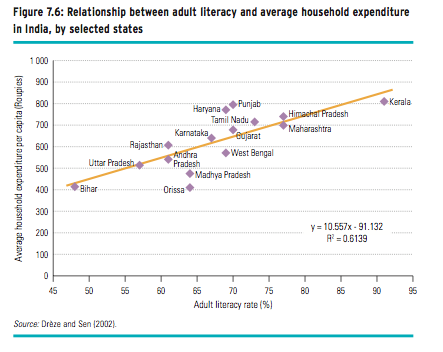 Why does India have such a large range in adult literacy between its states? Last year's day focused on the link with peace. Free online materials to help children and young people develop the study skills and information literacy they need in order to become independent learners and develop their full potential as individuals, citizens and workers in the 21st century. Live Below the Line is a global campaign (run normally in May) that’s changing the way people think about extreme poverty – and making a huge difference in the fight against it! Take the challenge to live on €1 a day for all your food and drink for five days to coincide with World Food day and the International Day for the Eradification of Poverty, and catch a glimpse of the challenges and lack of choice faced by the 1.4 billion people who survive on the equivalent of €1 a day for all their needs, every day. We want you to volunteer to live below the line. We want you to document your week with a video diary of the food you eat, the challenges you face and your reflections of the 1 billion people that have to meet their daily needs on that amount. We want you to donate or collect sponsorship for your efforts. The following three websites are full of useful and thought provoking resources that you can use for shorter discussion to develop the issues of poverty, food scarcity, rural women and climate change. 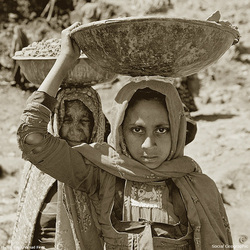 This lively, fast-moving, photo and video-based lesson provides a chance to reflect on some of the complex factors affecting access to food in a global world, in particular looking at the effects of conflict. 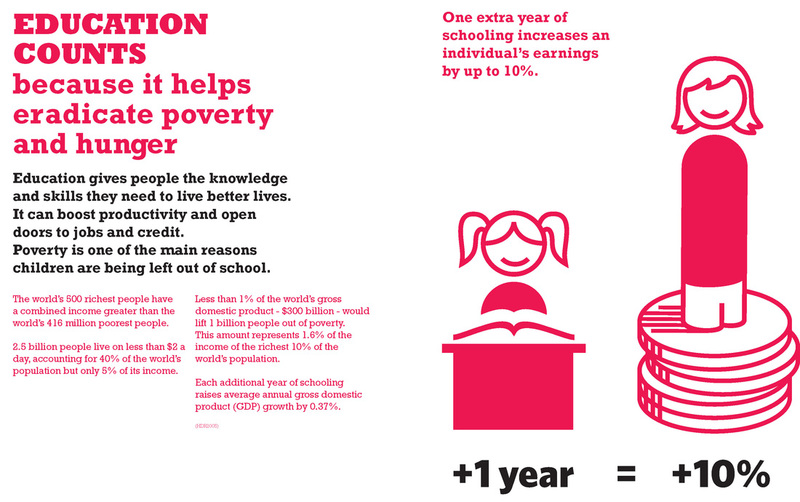 Explanation of some of the issues behind the Make Poverty History Campaign and why it is so important, on the Oxfam's Cool Planet website for young people. Suitable for ages 13-16, this set of resources from Oxfam places the focus of the impact of climate change on the world's poor and challenges learners to understand climate change as a controversial and contemporary human crisis that requires engagement and action. Wear it Pink Day is the Breast Cancer Campaign's biggest fundraising event. The aim of the day is to wear something pink and donate £2 to Breast Cancer Campaign. In 2010, hundreds of thousands of people took part, raising more than £2 million. 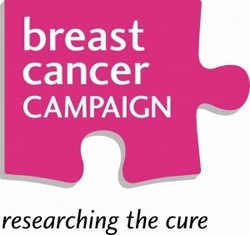 Information from the Breast Cancer Campaign about organising an event for the day where participants wear something pink and donate £2 to Breast Cancer Campaign. This illustrated booklet is designed for people with learning disabilities, advising on regular breast checks for early signs of cancer. It also gives tips on staying healthy which can help prevent breast cancer. Information on the Marks on the Landscape website about the philosophy of the Maggie's Centres, established by Maggie Keswick who later died of cancer, and the contribution of her husband, Charles Jencks, to the Centres' inspirational and sympathetic architecture. Seasons for Growth is an education programme that gives young people and adults the opportunity to learn that change, loss and grief are normal and valuable parts of life. The programme provides participants with the knowledge, skills and attitudes to understand and manage their individual experiences. Winston's Wish has provided advice for parents and carers, school staff and other professionals dealing with bereaved children and young people. The guides can be downloaded as Word documents from the site. The International Day for Tolerance is a time for people to learn about respecting and recognizing the rights and beliefs of others. It is also a time of reflection and debate on the negative effects of intolerance. Live discussions and debates take place across the world on this day, focusing on how various forms of injustice, oppression, racism and unfair discrimination have a negative impact on society. The photo to the left comes from the Vilkaviskis Primary school in Lithuania. and shows the tolerance ship inspired by Ilya and Emilia Kabakov‘s Ship of Tolerance. 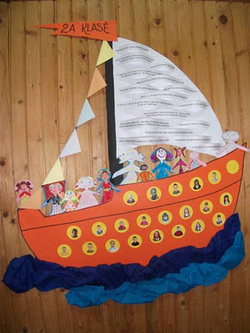 Click on the photo tot he left to see other class tolerance ships made by children at Vilkaviskis Primary School. A second organisation to link up with is Jane Goodall Roots and Shoots, which promotes educational projects on the themes of environment, animals and people. On every World Peace Day they promote and welcome schools to make a giant peace dove. Guidance on how to enter and ideas on what to do can be found on the linked website to Roots and Shoots above. Why not organise class/tutor activities around the theme of the ship of tolerance and the giant peace dove. This can be either classroom based or whole school. At our school we have a playground ship that we could decorate and in secondary school this could be a tutor group notice board. Alternatively a giant white dove march could be organised in the knowledge that thousands of other people and children all over the world are taking part in giant dove marches as well through Roots and Shoots. 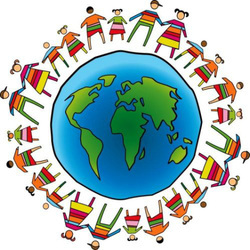 Universal Children's Day was established by the United Nations in 1954 to encourage understanding between children and promote children's welfare around the world. It is held on 20 November, the same day the UN General Assembly adopted the Declaration of the Rights of the Child in 1959 and signed the Convention on the Rights of the Child in 1989. Countries around the world celebrate the day in different ways - in some countries children receive presents, in others they take part in events and activities or are allowed a holiday from school. Learning materials and useful links to support using Universal Children's Day as a context for learning. 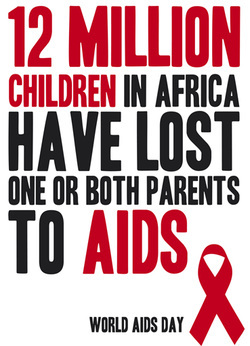 World AIDS Day is the focal point of the World AIDS Campaign, which is active all year round. On December 1, there are many health education campaigns that promote the day. Anti-discrimination activities are also launched on or around this date. Many people hold events on World AIDS Day to remember people who have died of AIDS-related conditions. One example is an AIDS Memorial Quilt project, which allows friends and family members of a deceased AIDS sufferer to construct quilt panels, which are then exhibited throughout the United States. AIDS stands for "acquired immune deficiency syndrome" or "acquired immunodeficiency syndrome" and denotes a condition, which results from the damage done by HIV (human immunodeficiency virus) to the immune system. The condition was first identified in 1981 and the name "AIDS" was first introduced on July 27, 1982. HIV can only be transmitted between people through direct contact of a mucous membrane or the blood stream with a bodily fluid. Hence, there has been a lot of stigma around the spread of HIV and people living with HIV and AIDS. It has been estimated that around 33 million people around the world have been infected with HIV and that around two million people die from AIDS related conditions each year. On October 27, 1988, the UN General Assembly officially recognized that the World Health Organization declared December 1, 1988, to be World AIDS Day. World AIDS Day has also been observed on this date each year since then. The Universal Declaration of Human Rights was drafted between January 1947 and December 1948. It aimed to form a basis for human rights all over the world. 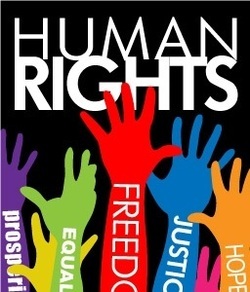 Each year Human Rights Day has a theme. Some of these themes have focused on people knowing their human rights or the importance of human rights education. Many event aims to educate people, especially children and teenagers, on their human rights and the importance of upholding these in their own communities and further afield. The day may also include protests to alert people of circumstances in parts of the world where the Universal Declaration of Human Rights is not recognised or respected, or where the importance of these rights are not considered to be important. Cultural events are also organized to celebrate the importance of human rights through music, dance, drama or fine art. Link to the Human Rights section of the United Nations website, including information grouped by thematic issues, international courts, tribunals and other resources. Online text of the Universal Declaration of Human Rights (UDHR) on the United Nations website. The Convention on the Rights of the Child, agreed by the United Nations, came into force in September 1990. The text of the Convention is available online or as a PDF file. This material looks at legal processes, specifically following the conflict during the 1990s in the former Yugoslavia. Find out about the war crimes trial of Dražen Erdemovic, a soldier in the 10th Sabotage Detachment of the Bosnian Serb Army. This teacher briefing focuses on the work of the International Criminal Court in The Hague. The Justice and Fairness teaching resource allows students to explore issues of fairness and justice through the lens of international humanitarian law or the “laws of war”. 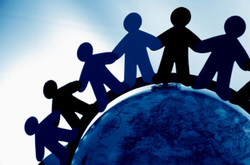 A teaching resource that introduces secondary school students to concepts of global citizenship. The Positive Images toolkit is an educational resource for teachers, youth workers and other educators to teach young people about migration and development. This interactive resource for 7-11 year olds enables young people to create their own model of an emergency camp through considering the tough choices people make in a disaster. Use this needs and wants auction activity to get young people discussing how to cope in a crisis. Why not organise a spontaneous show of action through a hand and paint mural. This could be prpared earlieir with an outline of larger picture that represents what you are looking for. Through their Women's Human Rights programme, Amnesty champion the rights of women and girls and hold governments accountable for ending discrimination and inequality. On January 27 each year, the United Nations (UN) remembers the Holocaust that affected many people of Jewish origin during World War II. This day is called the International Holocaust Remembrance Day. The Holocaust, or Shoah (Sho'ah, Shoa), is the term used to describe the deliberate murder and desecration of millions of people prior to and during World War II in Germany and German occupied areas in Europe. Many of them were Jewish but the Roma people, Soviet civilians and prisoners of war, ethnic Poles, people with disabilities, homosexuals and political and religious opponents were also killed. Many people died in concentration and death camps spread across Nazi-occupied Europe. One of the most notorious camps was Auschwitz-Birkenau, near Oświęcim, Poland. More than one million people died in Auschwitz-Birkenau before Soviet troops liberated it on January 27, 1945. Teachervision - Full of resources to explore the holocaust and its legacy. 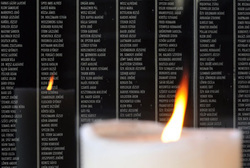 Information, news and resources about the international Holocaust Memorial Day - 27 January. This website has been designed to be the key resource for teachers in the UK who are planning activities for Holocaust Memorial Day. This American site strives to combat prejudice and bigotry by transforming the horrors of the Holocaust into positive lessons. There are a wide range of downloadable resources. The Holocaust Educational Trust's 'Lessons from Auschwitz' project for sixth-form students and their teachers includes a one-day visit to the former Nazi extermination camp of Auschwitz-Birkenau in Poland. United States Holocaust Memorial Museum - For EducatorsThe site uses photographs, maps, audio clips and images of artifacts. In the teachers section, there are guidelines and resources. Information about International Holocaust Remembrance Day, 27 January. The Holocaust Educational Trust aims to educate young people from every background about the Holocaust and the important lessons to be learned for today. The Center for Holocaust and Genocide Studies is based at University of Minnesota. This website also offers a variety of teaching resources and offers ideas for teachers. The BBC website has many resources relating to the life of Anne Frank. On International Mother Language Day the UN's Educational, Scientific and Cultural Organization (UNESCO) and UN agencies participate in events that promote linguistic and cultural diversity. They also encourage people to maintain their knowledge of their mother language while learning and using more than one language. 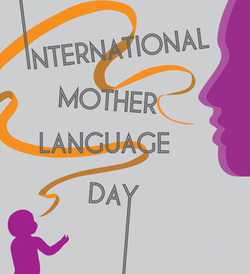 Governments and non-governmental organisations may use the day to announce policies to encourage language learning and support. Indigenous languages are under threat. According to UNESCO, approximately 600 languages have disappeared in the last century and they continue to disappear at a rate of one language every two weeks. Up to 90 percent of the world’s languages are likely to disappear before the end of this century if current trends are allowed to continue. International Women’s Day events are held worldwide on March 8. The messages given from the UN on this day often focus on various themes such as innovation, the portrayal of women in the media, or the importance of education and career opportunities. Many students in schools and univesrities participate in special lessons, debates or presentations about the importance of women in society, their influence, and issues that affect them. In some countries school children bring gifts to their female teachers and women receive small presents from friends or family members. 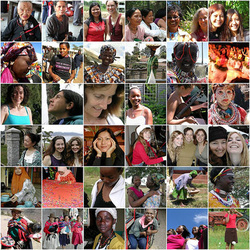 A global hub for sharing International Women's Day news, events and resources. Ideas for how you can get involved in International Women's Day. Women of Scotland is a project for locating and recording memorials commemorating the lives and achievements of women throughout Scotland. A collection of teaching resources including an activity pack and lesson plan about women's rights. The United Nations’ (UN) International Day for the Elimination of Racial Discrimination is observed with a series of events and activities worldwide on March 21 each year. The day aims to remind people of racial discrimination’s negative consequences. It also encourages people to remember their obligation and determination to combat racial discrimination. The International Day for the Elimination of Racial Discrimination is observed on March 21 because on that day in 1960, police opened fire and killed 69 people at a peaceful demonstration in Sharpeville, South Africa, against the apartheid pass laws. Proclaiming the day in 1966, the United Nations General Assembly called on the international community to redouble its efforts to eliminate all forms of racial discrimination. Find out more about this day including its background and some of the events held. Watch a clip from the Show Racism the Red Card Scotland educational DVD, featuring top footballers including Thierry Henry, Stephen McManus, Barry Ferguson and Julie Fleeting. As this day falls on International Poetry Day it may be an opportunity to combine the two days and hold events in school related to poetry, rap, artistic expression and music. Each year the UN decides on a theme for exmaple in 2012 the theme was Racism and Conflict. Watch this space of more information on the theme of 2013. In addition, some time could be spent on Martin Luther King. The video rap, Let Freedom Ring below could be an opener and his famous speech 'I have a Dream' is recorded and the transcirpt povided on the link above. Agenda 21 is a worldwide action plan for areas where human activities may affect the environment. It was adopted at the UN Conference on Environment and Development in Rio de Janeiro, Brazil, in June 1992. Agenda 21 recommended various measures, including creating World Water Day. The UN General Assembly adopted a resolution on December 22, 1992, declaring March 22 to be the World Day for Water each year. Countries were encouraged to develop activities to highlight local needs for water. The first World Day for Water was observed in 1993. The Water for Life Decade was launched on World Water Day in 2005. This decade will run from 2005 to 2015 and give a high profile to women's participation and the UN's water-related programs. An area packed full of inspiring activities, games, fundraising ideas and information for teachers, youth leaders and young people wanting to learn more and get involved with WaterAid. A video clip from the BBC explaining how water is cleaned and returned to the sea before evaporating and re-entering the water cycle. A website produced by Scottish Water and aimed at educating school children about the importance of water and the processes involved in its supply. The site includes an interactive learning game based on an imaginary Scottish island. Teachers can access downloadable worksheets and notes. STEM Central, Education Scotland's website looking at engineering through sciences, technology and maths, examines the role of engineering relating to water, waste water and flood protection. This short, instructive and lively assembly is designed to give students a skill that, if practised, will last them a lifetime. A campaigning organisation fighting to end water povrty. The site has many resources to explore in class time and organises the global campaign walk for water. Schools can join this annual campaign by walking 3km for water before returning to school. Earth Hour is the single, largest, symbolic mass participation event in the world. Born out of a hope that we could mobilize people to take action on climate change, Earth Hour now inspires a global community of millions of people in 7,001 cities and towns across 152 countries and territories to switch lights off for an hour as a massive show of concern for the environment. Find out more about World Health Day. Activities linked to Global Handwashing Day. This activity kit focuses on the human response to HIV and AIDS and on the reactions of other people. The April 22 Earth Day is usually celebrated with outdoor performances, where individuals or groups perform acts of service to earth. 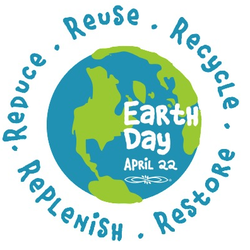 Typical ways of observing Earth Day include planting trees, community clean-ups, conducting various programs for recycling and conservation, using recyclable containers for snacks and lunches. Some people are encouraged to sign petitions to governments, calling for stronger or immediate action to stop global warming and to reverse environmental destruction. Television stations frequently air programs dealing with environmental issues. Watch the following official video for 2013. The year 1994 was proclaimed as the International Year of Families by the United Nations. This was a response to changing social and economic structures, which have affected and still affect the structure and stability of family units in many regions of the globe. 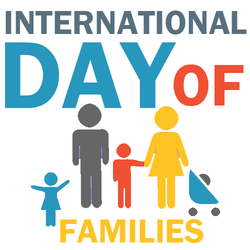 The International Day of Families, on May 15, is an occasion to reflect on the work started during 1994 and to celebrate the importance of families, people, societies and cultures around the world. It has been held every year since 1995. World Environment Day was established by the United Nations General Assembly in 1972 to mark the opening of the Stockholm Conference on the Human Environment. Another resolution, adopted by the General Assembly the same day, led to the creation of UNEP. It is hosted every year by a different city and commemorated with an international exposition through the week of June 5. An interactive online resource to help learners understand environmental impact by calculating ecological footprints for themselves and their schools. Month-by-month examples of how Scotland's climate is changing and the effect on wildlife and plants, published in English and Gaelic. Resources and ideas for interdisciplinary learning experiences focused on creativity skills and the Scottish landscape, suitable for second, third and fourth level learners. Environmental award scheme encouraging people to be responsible for the natural environment. Page on the Scotland's History website about Jewish communities in Scotland which grew as people fled from persecution in the nineteenth century and later arrived as refugees from Nazi Germany. Words and music on the Scotland's Songs website for a song which was written as a welcome for the exiled and homeless refugees who come to Scotland for shelter and help. A lesson plan suitable for 7-16 year olds aimed at helping students gain a wider and deeper understanding of the practical realities behind migration, one of the major global issues of the 21st century. A quick activity about learning a few words in an unfamiliar language.